Pretty Little Liars returns to ABC Family tonight with an all new Tuesday August 11, season 6 Summer Finale Episode 10 called “Game Over, Charles,” and we have your recap and spoilers below. On tonight’s Summer Finale episode, the girls discover Charles’ reasons for becoming “A” as they face their tormentor, and questions about Alison, [Sasha Pieterse] Bethany, [Kimee Balmilero] Black Widow and Red Coat are answered. On the last episode, it was prom time at Rosewood High, except for Alison, Aria, Emily, Hanna and Spencer who had been banned due to “security” concerns. As the girls saw this as the final humiliating blow to their high school careers, the girls’ mothers tried to make the best of a bad situation by offering a home prom in Spencer’s barn. At first reluctant, the PLLs agree and tried to make the best out of a bad situation. But one to never miss a formal, Charles has other planned in store to make this a night they’d never forget. Did you watch the last episode? If you missed it, we have a full and detailed recap right here for you. The season 6 episode 10 of PRETTY LITTLE LIARS is going to be really exciting and we’ll be recapping it for you right here. When tonight’s episode of Pretty Little Liars kicks off where we left off last week, the liars have left prom and are searching for Alison. They find her on the roof, Alison is begging Charles not to jump, he is standing on the ledge and wearing a black hoodie so we can’t see his face. The police are all waiting in the street with their guns drawn. Flashback to earlier that night at prom: Sarah, Spencer, Hanna, Emily, and Aria are outside looking for Alison. They find Mona dressed in a red hooded dress. Mona is looking for Alison too, she put a tracker on her phone. Mona says that Alison is at the Charasimi Group – they rush out of prom to go rescue her. Sarah whines that they should wait and talk to Tanner and tell her where they are going. The liars watch in shock as Cece sings, “Lord help the mister, who comes between me and my sister.” Cece tells Alison that she loved her like she was one of her own dolls. Apparently, Alison’s brother Charles is transgender. Cece has a flashback to Alison when she was just a baby – Charles thinks that she is sick and she won’t stop crying, so he puts her in a bath tub full of water. Mr. DiLaurentis rushes inside and fishes Alison out of the bath tub and screams that there is something wrong with him. Cece explains that it was an accident and she was trying to help Alison. Alison is confused she doesn’t understand how Charles became Cece. Cece explains that ever since she was a little boy she wanted to wear dresses. And, when their dad caught her playing dress up he shipped her off to Radley. She was completely alone, and when she turned 12 Mrs. DiLaurentis came and brought her a yellow dress for her birthday. She always snuck in clothes, the same exact outfits that she bought for Alison. Cece has another flashback – to when she was 12 years old and befriended Betheny Young. They were playing on the rood at Radley and Cece was wearing her dress. Toby’s mom came up on the roof and Cece freaked out because she didn’t want Mrs. Cavanaugh to see her wearing a dress. Betheny pushed Toby’s mom of the roof, and then she blame it on Cece/Charles. No one believed that Charles was innocent, not even his mom – so she paid off WIlden to rule Toby’s mom’s death a suicide. The day that they left for Cape May, Mrs. DiLaurentis realized that their friend Cece was actually her daughter/son Charlotte. Their mom freaked out, she didn’t want Mr. DiLaurentis to figure it out because she lied and told him that Charles was dead. Cece was furious – she couldn’t believe that her mother lied and told everyone that they were dead. Meanwhile, the liars see another screen – it’s a live feed of Radley – there is another “A” at Radley in a red coat, she is planting a bomb at the hospital. Cece reveals that Bethany was a psycho, and she stole her clothes and snuck out of Radley – she was going to kill their mom. When they got back from Cape May, she thought Alison was Bethany when she saw her in the yard and she hit her over the head with a rock. Then she realized she had made a huge mistake, and she had hit Alison. Mrs. DILaurentis saw the whole thing – she thought that Alison was dead, she dug a hole in the yard and buried her so that Cece didn’t get in trouble. Cece sat on the ground and sobbed hysterically while their mom buried Alison – she wouldn’t even look at her. Meanwhile, Mona hears the story and breaks down in tears. She confesses to the liars that she is the one that killed Bethany. She hit her over the head with a shovel, because that same night she thought that Bethany was Alison and she was trying to kill Alison. After Mrs. DILaurentis buried Alison, she called Wilden and paid him off to take Cece back to Radley. After Cece got back to Radley, they checked Mona in. Mona was so drugged up that she thought Cece was Alison. She told Cece all about the “A” game, and what she had done to the liars – then she started helping Cece sneak in and out of Radley. Cece tells Alison that she kept seeing a girl in blond hair and a red coat, and she realized that it was Alison and if the liars were in trouble – Alison would come to save them. That is when she set the lodge on fire. Cece confesses that Sara Harvey was the other Red Coat, and she has been working with Cece all along. Cece confesses that she killed WIlden – and she did it to make sure that he didn’t hurt Alison. She sent Sarah to his funeral dressed as the mysterious black widow to make sure that WIlden’s body was there and he was really dead. The liars begin panicking because they realize that the bomb that Sarah Harvey was planting is going to go off soon. The liars break the glass and get out of the office. Mona refuses to leave because she wants to hear how Cece’s story ends. Meanwhile, Cece is explaining to Alison that she snuck home and she found their mom dead outside. Fast forward 5 years later: Alison is standing in a classroom and writing her name on the chalkboard, she’s a teacher. 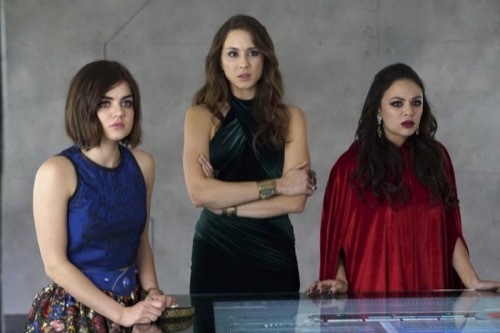 Spencer, Aria, Hanna, and Emily rush in – they shout that someone is coming for Alison.